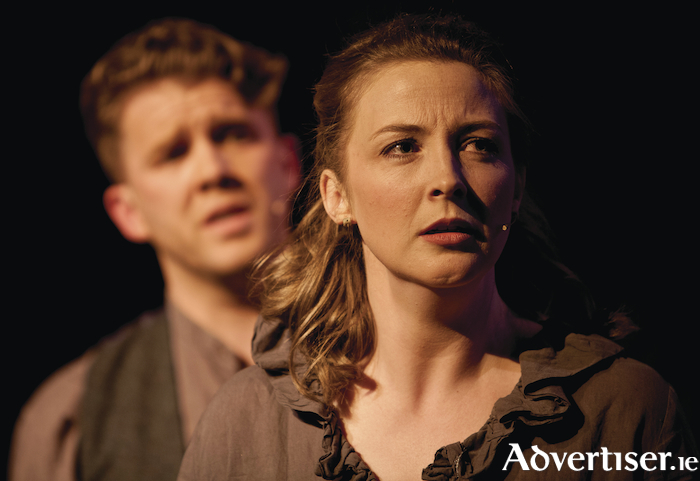 Anne O'Donnell as Emily Tallentire, and Alan Greaney as Jackson Pennington, in Galway Musical Society's production of The Hired Man. LAST NIGHT, Tuesday May 1, at the Black Box Theatre, Galway Musical Society presented the opening night of its terrific production of the musical, The Hired Man, based on Melvyn Bragg's stirring novel of Cumbrian rural and industrial working life in the first quarter of the 20th century. Scored by Howard Goodall, it is a sweeping family saga centred on the couple John and Emily Tallentire whose journey takes in farm work, coal mining, and the First World War as well as strains on their marriage and the death of their son on the battlefields of France. The show opens with a full cast choral rendition of the ‘Song Of The Hired Man’ in a scene where rural labourers have assembled in search of seasonal contracts with big local farmers. It points up that the musical is not just the tale of the Tallentire family but also that of the British working class, both rural and urban, of the early 20th century. We see both their work, on farms or down pits, and their pastimes – wrestling contests, hunting with their dogs, evenings in the pub. We also witness the fierce struggle for trade union recognition and the economic vulnerability of labourers in relation to their employers (a scenario that is all too topical in our own day ). It is telling that even at the end of the play’s 20 year time span, John Tallentire is still the man for hire he was at its beginning. For all his years and experiences, his economic lot has not advanced. The musical’s focus on the working class is underlined by Goodall’s score which draws on the rich seams of English vernacular music with echoes of folk airs, brass bands, and church hymns, all of which are beautifully rendered by the 10 piece GMS orchestra under the musical direction of Shane Farrell. John Wright’s impressive and versatile set greets us with a gnarly tree and rural stone wall and vegetation before later transforming into a WW1 battlefield and subterranean mineshaft, while also smoothly accommodating the interiors of taverns and households. Director Paul Norton elicits great performances from his entire cast, none more so than Dave Langan and Ann O’Donnell in the central roles of John and Emily Tallentire who deliver both great singing and heartfelt, moving, portrayals of their characters. The musical has sometimes been described as ‘The Hired Man’s Wife’ and Anne O’Donnell is outstanding throughout. Alan Greaney also excels as Jackson Pennington, who has an affair with Emily which is powerfully dramatised in their duet ‘I Wouldn’t Be The First’. Further fine performances are delivered by Nicky Lawless, Frank ‘Jay’ Hall, Emily Macken, Keith Hanley as the rest of the Tallentire clan. Indeed, the whole cast are deserving of praise, as is choreographer Jay Molyneux, in his handling of the frequent crowd scenes which punctuate the action. The Hired Man is a hugely enjoyable production, with great performances and songs from first to last. It continues at the Black Box until Sunday May 6 at 8pm. For tickets contact the Town Hall (091 - 569777, www.tht.ie ).